Fact or fiction? Will Revolut Outpace the Banks? Earlier this week in an interview with The Times of London, Revolut founder Nikolay Storonsky referred to Revolut as the “Uber of banking.” According to Storonsky, in addition to Western Union slowly phasing out of the financial world, he believes in five to ten years only the biggest and best of the banks will still exist. Unsurprisingly, his claims are similar to those made by other fintech leaders. The real question is, are these claims realistic? What exactly will it take for startups like Revolut to replace big banks? Let’s take a closer look. Our analysis shows how far Revolut has to go to achieve it’s goal of 100 million customers. Can it be done, as their CEO has suggested, by providing the core product for free and monetising users through value-add services? How could Revolut get there? Let’s begin by taking a look how we estimate Revolut per customer revenue stacks up. Revolut is looking to win both business and individual customers and is offering a broad range of products from money transfer through to traditional banking and payments. 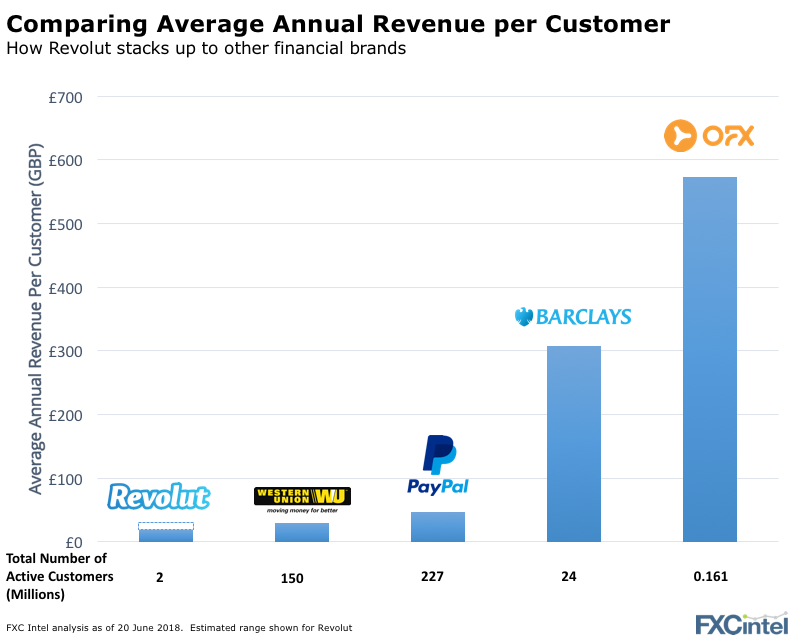 Each company above monetises its customers in a different way and counter to the implications of Revolut pushing lots of free services, we believe Revolut is making more per customer than they let on and are already monetising at levels of some of the market leaders. If it chooses to move up the value chain and become closer to a full bank, there is a lot more revenue available. OFX helps to highlight what the higher end customers in Revolut’s targeted international payments space could be worth too. Moving on to customer count, how might Revolut reach its goal of 100 million customers? Heavily monetise the data. As we’ve learnt from Facebook and Cambridge Analytica, if you’re a customer receiving a product for free, then you are the product. Put another way, Revolut’s plan appears to be to aggregate a large group of users, charge fees to a small portion of them and monetise the data on everyone else (who get the services for free). Unlike Facebook, Revolut’s data is not universal. Would selling the data to other finance companies power its competition? Leverage OpenBanking. Can Revolut provide a better gateway to a suite of financial products than the banks? If Revolut could pull the funds straight out of a user’s bank account without a user leaving the app, a whole barrier to adoption is knocked down. Face a limited competitive response from the banks and payment companies. The big banks above are well aware of Revolut (and the other fintechs). Every annual report focuses on the proportion of customers using digital products and these numbers are rising fast. 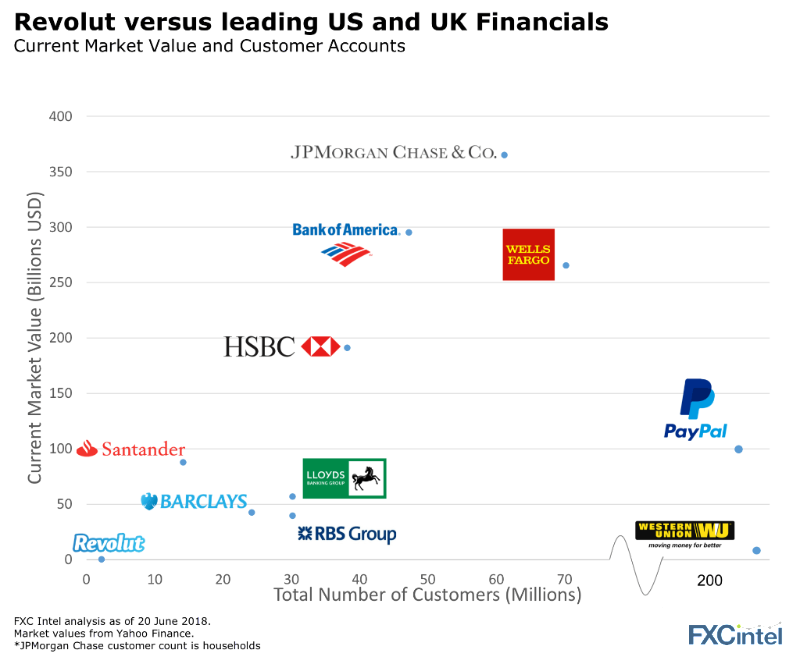 Revolut owning 100 million (active) high value customers would have to assume several of the major banks fail in their digital journeys. Can Revolut make enough money per customer to take a meaningful enough share of wallet to really play with (i.e. be valued on par with) the big boys?